The Hong Kong MTR (Mass Transit Railway) is the train system used in Hong Kong. The MTR uses a rapid transit railway system as well as a light rail system to get people from one destination to the next. 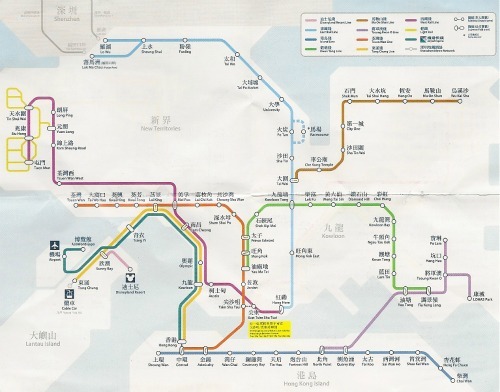 The Hong Kong MTR has 10 rapid transit lines and 1 light rail with 12 different routes. It goes to most of the main areas in Hong Kong spanning New Territories, Kowloon, Hong Kong Island, Lantau Island and the Hong Kong Airport. For some of the places that the MTR does not go to, feeder buses are set up at certain stations to take passengers to housing areas and points of interest. Of all the forms of transportation in Hong Kong, the MTR is the most popular and one of the most convenient ways of getting around. It’s also known to be one of the safest and most reliable railways in the world. The cost of taking the Hong Kong MTR is very affordable. Most one way rides on the MTR will cost you between $4-$12 Hong Kong dollars (approx $0.50-$1.50 USD). There are several ways to pay for using the Hong Kong MTR. You can pay with cash at a vending machine to get a single journey ticket which allows you a one time use to go to a prepaid station. You can use an Octopus Card at any MTR gate and it’ll take your balance off directly without even having to take the card out of your wallet. Octopus Card holders get an automatic discount on their fares by paying with this method. If you need to put more money on your Octopus Card, you can do so at any vending machine that you purchase tickets at. Credit card is only accepted to purchase airport express tickets. While you’re out and about, look for special fare saver machines located outside of some MTR stations. By putting your Octopus Card up to the fare saver, you’ll save a dollar or more on your next ride on the MTR. After waving your card at the fare saver, you must use your Octopus Card to pay for your ride within that day. You also can’t use the card to pay for anything else until you’ve used it for the MTR first or your discount will be gone. There are discounts given for children, seniors and students (up to the age of 25). Their rates will be cheaper than an adult when riding the MTR Hong Kong. You can buy a one day tourist pass that’s only available to tourists for $55 HKD. With this pass you can ride the Hong Kong MTR unlimited times for one day. You can purchase one from any MTR customer service centre. These passes have to be used within 30 days of buying them. There are certain lines that you can’t ride on with this day pass, one of them being the Airport Express line. You’ll need to ask customer service of any stipulations about any pass you buy so that you don’t get stuck having to pay more than you were expecting to. Other types of passes you can buy include an airport express pass for use on the airport express line, the tourist cross-boundary travel pass (offers 2 single rides to and from Lo Wo or Lok Ma Chau stations and unlimited use of the MTR and light rail for up to a 2 day period), and the day pass for unlimited travel to and from the Hong Kong Disneyland station. These special passes can be purchased at the MTR customer service centre. The tourist day pass and airport express pass can be purchased online as well. Something you may see while walking through the MTR Hong Kong stations are the MTR Malls. Certain stations have shopping malls built into the MTR station or located nearby. If the station you’re at doesn’t have an MTR mall, all stations are equipped with stores and shops that provide a wide variety of items for sale. This is a very convenient way to buy whatever you may need without leaving the train station. The Official MTR Website. You can find fare prices here.